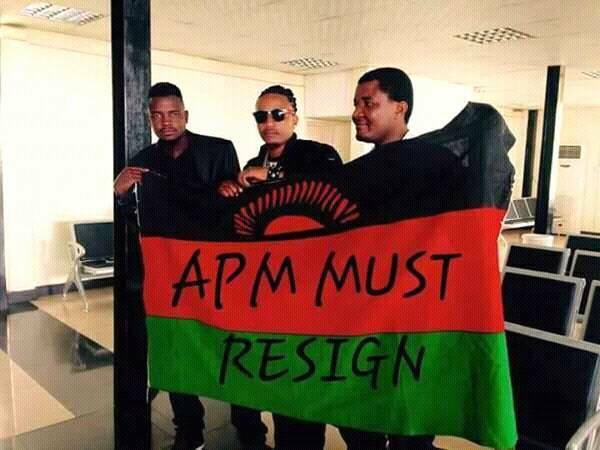 Well-known musician Skeffa Chimoto popularly known as ‘the jamming machine’ has distanced himself a photo showing together with Dan Lufani and Lulu holding Malawi flag calling for the resignation of President Professor Arthur Peter Mutharika. On Thursday the social media was awashed with photo showing Skeffa Chimoto together with Dan Lu and Lawrence Khwisa holding a national flag. The flag was carrying a message asking President Mutharika to resign barely hours after the resignation of President of South Africa Jacob Zuma. “I would like to inform the general public and all my beloved followers that the picture which has gone viral on social media showing Lulu, Dan Lu and myself holding the Malawi flag is altered by writing defamatory words against the country’s leadership. To put the record straight, the said picture was taken in 2006 when we went to UK for performance in Easter Fusion concerts. “Please ignore this picture and I forgive whosoever did it for the reasons best known to him or herself. My fellow Malawians, we have alot of things we can do to develop ourselves and develop our Nation rather than always politicking and doing character assassination for our fellow countrymen. This will take us nowhere,” wrote Chimoto. Meanwhile it is not known as to who doctored the photo.